« NEW LAUNCH! South Surrey BREEZE Cirrus Collection Townhomes by Adera! 2 – 4 Bedroom Townhouses for Sale! A beautiful new community in South Burnaby real estate district is now previewing at RedBrick by Amacon. Centrally located in the highly sought after Edmonds Burnaby neighbourhood, RedBrick Condos feature 1, 2 and 3 bedroom single-level condominium residences that are close to public transit, urban centres, shopping, dining, services and recreational facilities. Stride Avenue Park and the Urban Trail are just next door as are numerous green spaces and parks. The presale Burnaby RedBrick Edmonds Town Centre condos are also very close to Richmond, YVR Airport, downtown Vancouver, the Alex Fraser Bridge (to Surrey, Richmond and the US Border) in addition to New Westminster and Highway 1. For families, the new Edmonds RedBrick Burnaby condos are close to K.R.I.B. Youth Centre, Bryne Creek Secondary and Stride Avenue Elementary. Residents will also enjoy the close proximity to 2 SkyTrain stations at Edmonds and Royal Oak. The 4 level boutique apartment building will feature spacious floor plans, large windows and affordable pricing! The RedBrick Burnaby project consists of 2 four storey low-rise boutique residential buildings with a total offering of 245 suites for sale. Both buildings are being pre-sold together so it is not a phased development. 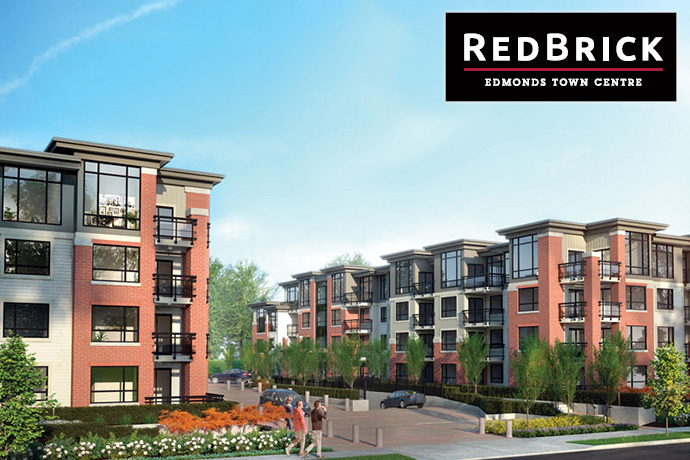 The Edmonds Burnaby RedBrick condos will break ground in early 2014 with an anticipated completion by early 2016. The ceiling height for the first to third floors are around 8 feet whilst the penthouse level (4th floor) has ceiling heights between 9 to 11 feet with pop ups and vaulted areas in the living room (depending on floor plan). Maintenance fees are roughly $0.32 per square foot and this includes both natural gas and hot water. The initial presales condo deals at RedBrick Burnaby Edmonds is $7,500 off 1 bedrooms and $10,000 off 2 bedroom suites (all units except for those facing the urban trail). This is only available as VIP discounts through specific agents. There is also an initial presale Burnaby RedBrick condo purchase promo of only 10% deposit. The RedBrick Edmonds condo project will include a private landscaped green space, a children’s outdoor play area and entertainment style barbeque terrace deck. The public art will be by Nancy Chew and Jacqueline Metz who are award winning local artists! In addition, the presale Burnaby RedBrick Edmonds condos will have on site amenities that include: an exercise facility with cardio machines and weight equipment, TV lounges and meeting rooms, crafts room, games room and a party kitchen with dining space for entertaining family and friends. The South Burnaby real estate development will also include an easy 2 vehicle Modo car sharing program so you don’t need to own a car! As well, green building materials and the use of recycled materials is a key to the healthy eco-friendly construction of the new Edmonds Red Brick condos in South Burnaby. All homes have double glazed and low emission window systems and water efficient plumbing fixtures. More information is online at www.liveatredbrick.com so register your interest today! The beautifully designed homes at RedBrick by Amacon includes 2 interior designer colour palettes called Juniper and Oak. These were carefully designed and selected by award winning Portico Design Group. 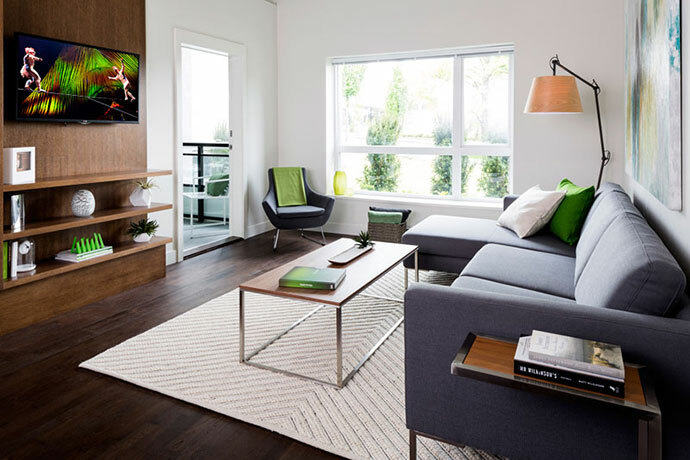 All homes at the presale Burnaby RedBrick Edmonds condos have Whirlpool front loading Energy Star washer and dryer as well as designer carpeting in the bedrooms and dens with comfortable underlay. As well, the main living areas (including the dining room, entry and kitchen) have beautiful engineered hardwood floors that are contemporary and very durable. 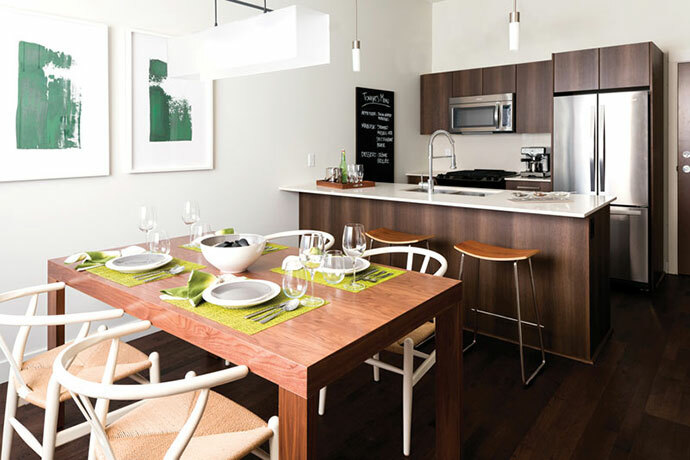 The kitchens at RedBrick by Amacon in South Burnaby real estate market includes a premium set of Whirlpool stainless steel appliances: microwave hood fan combination unit, dishwasher, French Door 30” fridge/freezer and gas range. As well, homebuyers will also get polished stone counters that includes a full height stone backsplash. The South Burnaby RedBrick condos will also have European inspired chrome hardware for the durable laminate flat panel kitchen cabinets. Double bowl stainless steel under mount sink and designer dual spray pull down faucet are also standard premium features here. 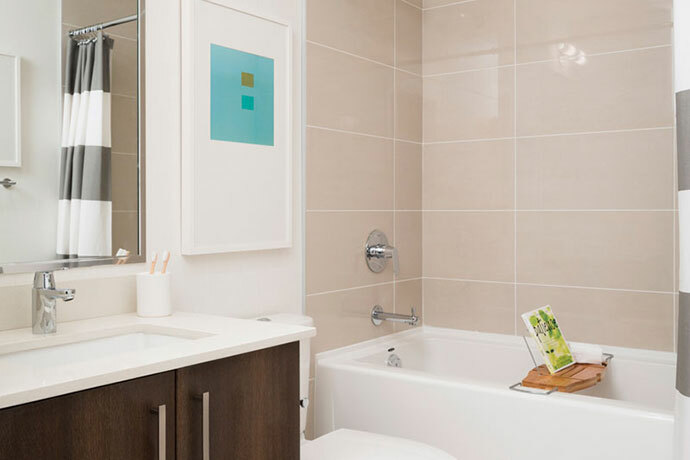 The bathrooms at the presale Edmonds RedBrick Burnaby condos includes polished stone slab counters, durable laminate cabinetry with clean square edge profile and Euro inspired chrome hardware. The toilets are low profile, low flow and dual flush for water conservation and there are undermount sinks and oversized porcelain tiled floors. The bathrooms also have European inspired faucets and shower systems in chrome finish for the ultimate contemporary design. All homes come with the 2/5/10 year new Home Warranty by Travelers. The ground floor apartments have alarm systems for all windows and doors that open. There is restricted floor access for extra security and the underground parking and bike storage lockers are secured. The main entrance lobby, amenity spaces and parking are all secured by keyless entry fobs. The new Edmonds condos at RedBrick Burnaby are brought to you by Amacon developers and the preferred lenders are TD Bank and RBC. There is a fine selection of 1, 2 and 3 bedroom floor plans available at RedBrick Edmonds Town Centre apartments. Plan A3 is the smallest featured RedBrick floor plan and it’s a 1 bedroom plus flex/den at 593 square feet with a balcony. Layout B is slightly larger at 624 square footage. The Plan C layout features 2 bedrooms and 2 bathrooms at 842 square feet while Plan D is a 2 bedroom plus flex floorplan at 821 to 889 sqft. RedBrick floor plan E is a 2 bed+den and 2 bathroom layout at 936 square feet. Last but not least is the extra spacious 3 bedroom plus den + 2 bathroom Burnaby RedBrick floor plan F at 1,097 square feet. 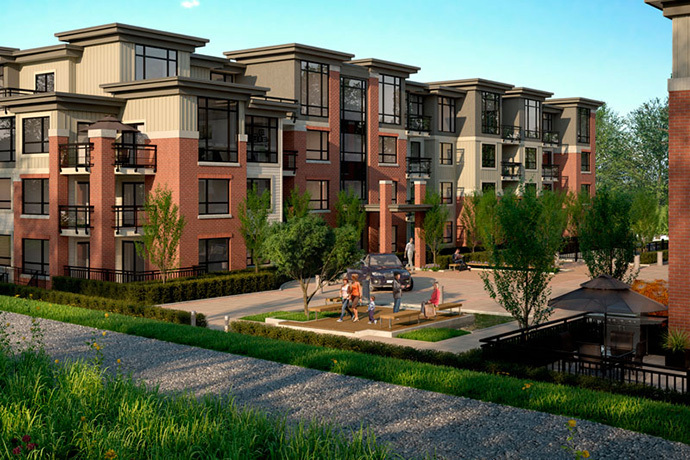 Brought to you by Amacon RedBrick Burnaby Edmonds apartment residences is located on the edge of the slopes overlooking the Fraser River Valley. This beautiful setting will be home to beautiful condos which will present great value to home buyers in a convenient and established South Burnaby real estate neighbourhood. 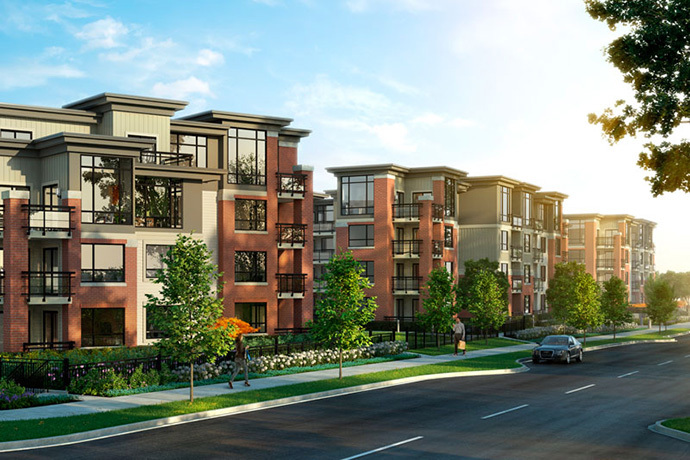 The contemporary and spacious Burnaby RedBrick Edmonds Condos for sale will be designed to offer families and professionals with comfortable, affordable and well-designed homes that feature room to grow and plenty of storage space. Coming to the Edmonds Town Centre district, watch out for more information about the RedBrick Burnaby condos coming late 2013 by Amacon developers. A PLACE TO LIVE. A PLACE TO LOVE. These homes are built for living. From the spacious outdoor spaces that are ideal for entertaining guests to the spacious interiors that are fit for growth and relaxation, the new Burnaby RedBrick Edmonds Apartment homes are surrounded by everything you need, whether it be transit, urban trails, top ranked schools, shopping or dining. South Burnaby apartments for sale in Edmonds Town Centre are close to everything. Best of all, the Red Brick Burnaby condo development will feature a wide selection of 1, 2 or even 3 bedroom homes. All built by Amacon, a trusted builder in the local market with generations of experience. Register your interest online here or you can visit their marketing web site at www.liveatredbrick.com. The project site at Red Brick Condos in Burnaby Edmonds area are situated on a slope that is south facing, giving residents ample natural daylight and views overlooking the mighty Fraser River. In addition, the RedBrick Condos in Burnaby are very close to public transit routes including the SkyTrain in addition to many urban, biking, and walking trails. Top ranked schools for all ages are also within walking or short driving distance away. The presale Burnaby Red Brick Edmonds condos will also feature large floor plans ranging between 541 square feet (one bedroom) to very large family sized 3 bedroom plus den layouts that are very much suited for families. This is one of the best values in the Edmonds Burnaby real estate market for brand new product, so don’t miss out!